Vestibular Rehabilitation is a program designed to assist individuals in decreasing or eliminating their symptoms of vertigo, dizziness, imbalance, or unsteadiness. 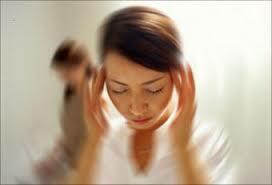 There are many different causes of dizziness and imbalance. A Physical therapist trained in vestibular rehabilitation will perform an evaluation to determine your problem areas. We will review your symptoms, take a medical history, and assess balance, gait, visual stability, neck motion, and positional faults. We will look at your strength and flexibility. Once we review the findings a treatment plan will be developed based on each individuals needs. Depending on the cause, the length of treatment varies and could consist of 1-2 visits, or a more extensive program may need to be developed. Diagnosed with dizziness, benign paroxysmal positional vertigo (BPPV), imbalance, and unsteady gait. Would you benefit from Balance and Vestibular Therapy? Do you have the fear of falling? Do you have any difficulty with walking or standing? Do you use a cane, walker, or crutches, or have to hold onto things (like walls, back of the couch) when you walk? Do you have difficulty walking outdoors on grass or un-level surfaces? Do you have to use your arms to get up out of a chair? Do you experience dizziness when lying or rolling in bed, or bending down to tie your shoes? Do you lose your balance when you turn or make quick movements? Do you get dizzy with quick head movements or when you turn around? Does your vision become less clear with walking or quick head movements? Do you get dizzy driving in a car or walking in a crowded area? Do you have difficulty maintaining your balance during normal daily activities? Do you have more than three chronic health conditions (heart disease, lung disease, diabetes, neuropathy, high blood pressure, arthritis, osteoporosis, etc.)? If you answered YES to any of the questions above, a Physical Therapist at Coppola Physical Therapy may help you regain your confidence and decrease your risk of falling by decreasing your symptoms of dizziness/unsteadiness, improve your strength, flexibility, endurance, and balance reactions, and improve gaze stability, thereby keeping you active in your home and community.